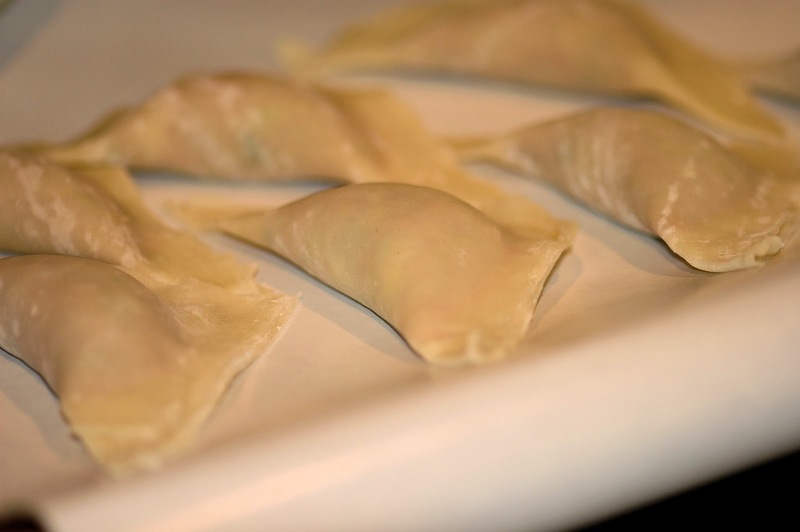 I really enjoy Chinese food and have always wanted to try making different dumplings. I was a little intimidated about the process until I saw a class entitled Favorite Asian Dumplings from Scratch. It's a Craftsy class that I bought during one of their big sales and it was just the push I needed to get me started. If you would like to see Ms. Nguyen in action, her Craftsy Favorite Asian Dumplings is awesome. I am not a member of the affiliate program so no one is paying me to let you know how much I like Craftsy classes. Here is a link to the book I got in case you want it as well. I am a member of Amazon's affiliate program so if you decide to buy the book using the link below, I will get some pocket change to spend. It does not add anything to the cost that you pay. It's just a nice thank you to me if you find my blog helpful to you. For my first dumplings, I did the easy thing and purchased pre-made wrappers from our local market. I was really impressed with how easy they were to use. I had read stories about them being difficult but these must have been really fresh because it was really easy and fun making the dumplings. The outside of the wrapper says: Mandarin won ton wraps. I tried to follow most of her instructions but did vary a little. Put chopped cabbage in food processor and pulse several times until finely minced. You can do this by hand as well. Place minced cabbage in strainer and sprinkle 1 teaspoon of kosher salt on top and allow to sit for at least 10 minutes. Place ground pork, ginger, green onion, pepper, soy sauce, rice wine, and sesame oil in processor and pulse several times OR mix all ingredients in bowl well to incorporate. 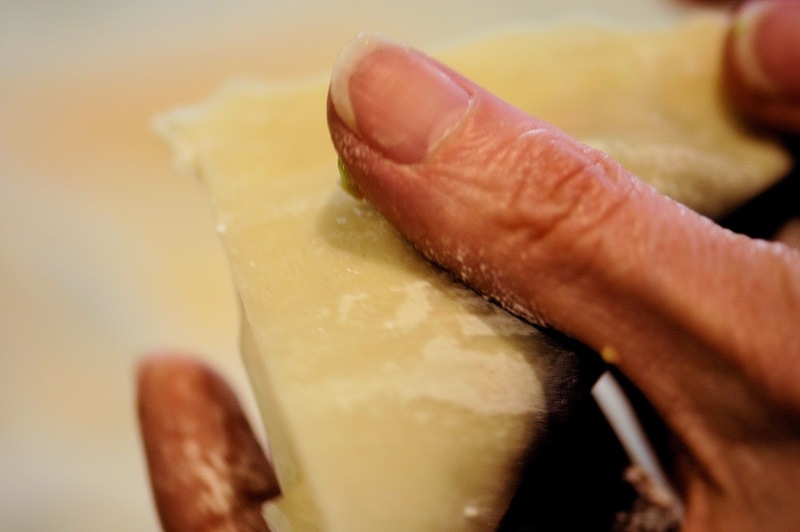 Next is to squeeze as much water out of the cabbage as possible so it doesn't make your dumplings too wet. I grabbed a hand full of cabbage and squeezed as tightly as possibly and then dumped the cabbage into the pork mixture. Repeat process until all cabbage has been squeezed and added into the pork mixture. I thought it was amazing how much water came out of the cabbage so don't skip this step! Stir mixture well until all ingredients are mixed well. Place about 1 tablespoon of filling onto center of dumpling. 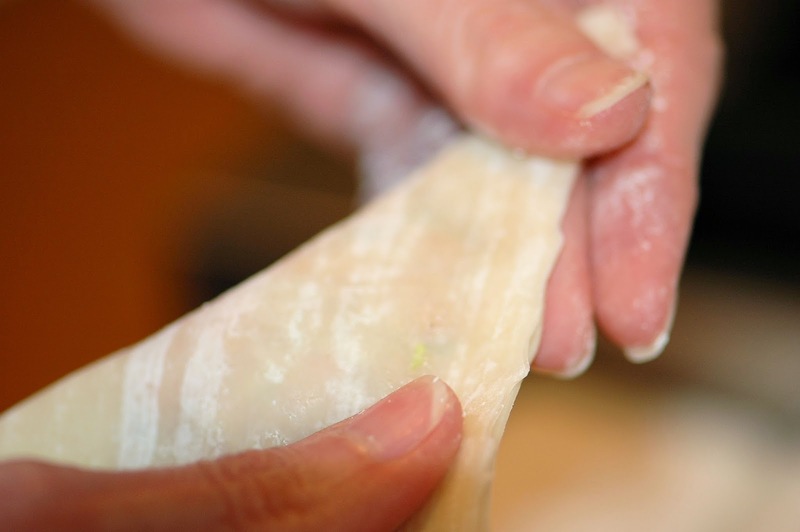 Dip your finger into the water and run along the bottom side of the dumpling. 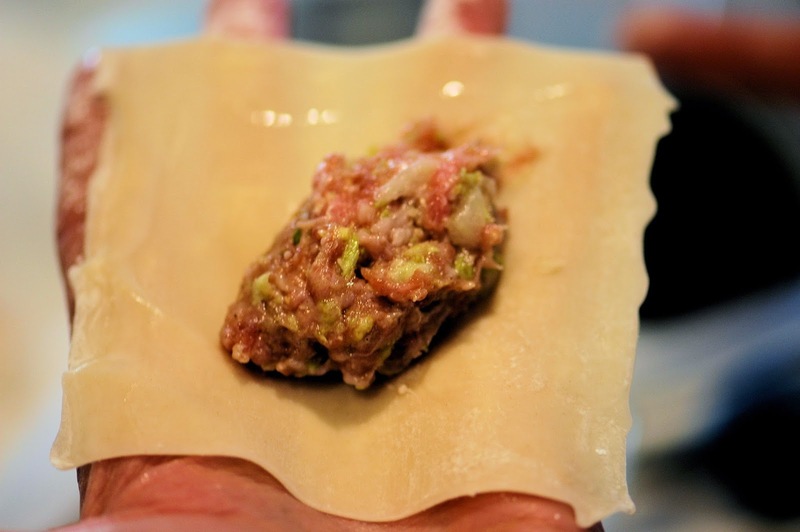 Bring top of dumpling over the filling and press onto the side you just dampened. Press the edges well working to make sure you have no air bubbles left inside. If you find you are having problems with the sides staying together, you can add a little bit of corn starch to your water to make it more glue-like. Place dumpling on baking tray and cover with slightly dampened towel. Continue making dumplings until all mixture is gone. I had enough pork mixture to use up every wrapper in the container. I didn't count them but there must have been at least 50. I cooked about a third of them right away and left the others on the tray to freeze and once they were frozen, I put them into freezer bags to have at a later date. Put water in a large pot and fill half way up with water. Bring to a boil. Add dumplings one at a time and using spoon don't allow the dumpling to sit on the bottom of pan or it will stick and break open your dumpling. It only takes about 5 seconds of movement and then you can allow it to cook without fussing over it. 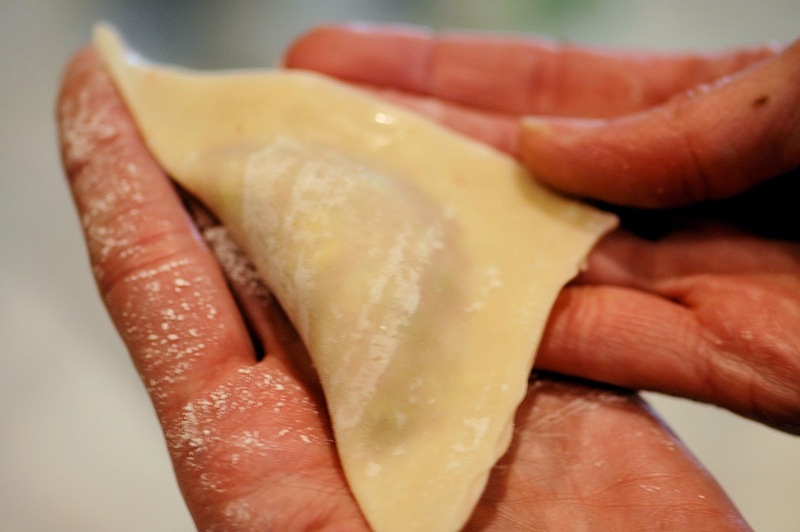 Don't put too many dumplings in at the same time as they need to be able to move freely. Cook dumplings on a gentle boil for 8 to 9 minutes. 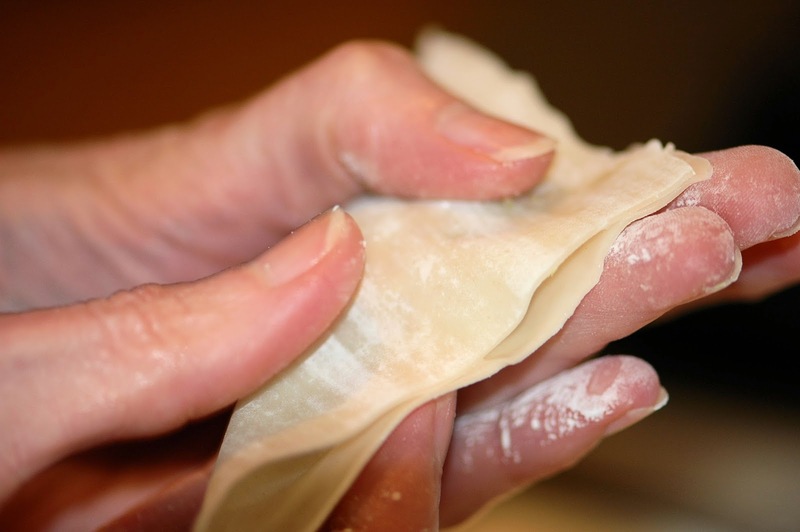 Remove dumpling with a slotted spoon allowing water to drip off and then place in serving bowl. Serve with your favorite dipping sauce. These have a fantastic flavor and you may end up having to cook a few more. I did! Note: I had a hard time finding Shaoxing rice wine until I listened to my husband and went to the wine area of the Asian market. I was convinced it should be where the vinegars, sauces were located. I'm so glad he was with me or I would have not had that ingredient. She says that dry sherry can be substituted but I wanted the traditional flavoring.